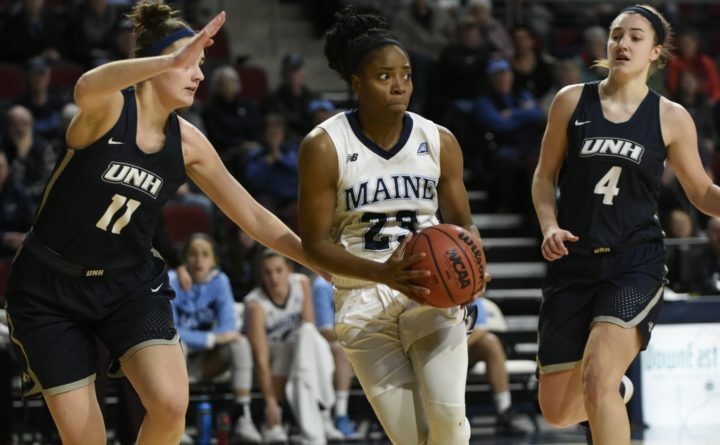 Tanesha Sutton (center) of the University of Maine looks to make a pass amidst defensive pressure from the University of New Hampshire during a recent game. Sutton led the Black Bears to victory over Vermont on Wednesday night. Senior forward Tanesha Sutton went 11-for-16 from the floor on her way to a game-high 27 points on Wednesday night, propelling the University of Maine women’s basketball team to a 63-51 America East victory over Vermont at Patrick Gym in Burlington, Vt.
Sutton, who matched her career scoring high, was a stabilizing force for the Black Bears (10-6 overall, 3-0 AE), who shot only 27 percent (12-for-44) among their other eight players. Blanca Millan scored 15 points and grabbed seven rebounds and Parise Rossignol of Van Buren contributed 11 points and six rebounds for UMaine, which committed only three turnovers. Hanna Crymble paced Vermont (5-10, 1-2 AE) with 14 points and seven rebounds and Jose Larkins posted 13 points with four assists. The Catamounts shot 44 percent (21-for-48) and hung around throughout, never letting the Black Bears extend their lead beyond 12 points. UMaine finally regained the upper hand for good during the last 4 1/2 minutes, manufacturing a game-ending 16-2 run to put the Catamounts away. Crymble gave Vermont a 49-47 lead on a layup with 4:47 remaining, but the Black Bears had an answer. Sutton scored from the paint to tie the game, then made a layup a minute later to give UMaine a 51-49 edge. Dor Saar and Rossignol hit 3-pointers 50 seconds apart, then Rossignol converted a fast-break layup to make it 59-49 with 1:05 left. Vermont started well and led 9-6 midway through the first quarter, but Sutton scored twice from close range and Millan added a jumper as UMaine ended the first quarter on a 10-2 run that gave it a 16-11 lead. The Black Bears continued their surge as a Millan jumper, Sutton’s layup and a Kelly Fogarty 3-pointer made it 23-11 with 8:39 to play in the second quarter. However, the Catamounts responded. Vermont peeled off a 14-2 burst of its own, capped by a Larkins 3-pointer that tied the game 25-all with 2:55 remaining in the half. But Sutton stemmed the tide with a layup and Millan answered a Crymble basket with a 3-pointer to give UMaine a slim 30-27 edge at halftime.